The Crusades were a series of military conflicts of a religious character waged by much of Christian Europe against external and internal threats. Crusades were fought against Muslims, pagan Slavs, Russian and Greek Orthodox Christians, Mongols, Cathars, Hussites, Jews, and political enemies of the popes. Crusaders took vows and were granted an indulgence for past sins. The Crusades originally had the goal of recapturing Jerusalem and the Holy Land from Muslim rule and were originally launched in response to a call from the Eastern Orthodox Byzantine Empire for help against the expansion of the Muslim Seljuk Turks into Anatolia. The term is also used to describe contemporaneous and subsequent campaigns conducted in territories outside the Levant usually against pagans, heretics, and peoples under the ban of excommunication for a mixture of religious, economic, and political reasons. Rivalries among both Christian and Muslim powers led also to alliances between religious factions against their opponents, such as the Christian alliance with the Sultanate of Rum during the Fifth Crusade. The Crusades had far-reaching political, economic, and social impacts, some of which have lasted into contemporary times. Because of internal conflicts among Christian kingdoms and political powers, some of the crusade expeditions were diverted from their original aim, such as the Fourth Crusade, which resulted in the sack of Christian Constantinople and the partition of the Byzantine Empire between Venice and the Crusaders. The Battle of Covadonga was the first major victory by a Christian military force in Iberia following the Muslim Moors' conquest of that region in 711. 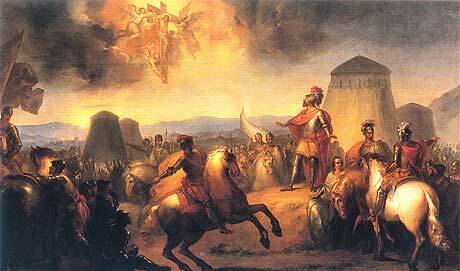 Taking place about a decade later, most likely in the summer of 722, the victory at Covadonga assured the survival of a Christian stronghold in northern Iberia, and today is regarded as the beginning of the Reconquista. From the perspective of the following seven centuries, this view of the battle has some validity - since the battle assured the independence of the Kingdom of Asturias, and it is that kingdom which eventually became the nucleus of new Christian rule over the entire peninsula. There is no reason to assume, however, that contemporaries (either Christian or Muslim) regarded it as anything more than part of local rebellion in a marginal area. In evaluating the battle, care must be taken to distinguish the actual historical facts from the meanings read into it and the myths created around it by later Spanish and Portuguese generations. The Battle of Ourique (Portuguese pronunciation: [oˈɾik(ɨ)]) took place in July 25 (St. James day) 1139, probably in the countryside outside the town of Ourique, present-day Alentejo (southern Portugal), but there is no certainty about its exact location. In this battle, the forces of Portuguese Prince Afonso Henriques (of the House of Burgundy) clashed against the Almoravid Moors led by Ali ibn Yusuf. ...that the Crusade of Varna was a string of events in 1443–44 between the Kingdom of Hungary, the Serbian Despotate, and the Ottoman Empire that culminated in a devastating Hungarian loss at the Battle of Varna (pictured) on 10 November 1444? ...that the Wendish Crusade was an 1147 campaign of crusaders against the Wends of what is now northern and eastern Germany that forced tribute from the pagan Slavs? ...that the Prussian Crusade was a series of 13th-century campaigns of crusaders, primarily led by the Teutonic Knights, to Christianize the pagan Old Prussians? Vlad III the Impaler, Prince of Wallachia called "Vlad the Impaler" (that is, Vlad Țepeș, Romanian pronunciation: [ˈt͡sepeʃ] in Romanian; also known as Vlad Dracula or simply Dracula, in Romanian Drăculea; 1431 – December 1476), was a Wallachian (southern Romania) voivode. His three reigns were in 1448, 1456–1462, and 1476. Vlad the Impaler is known for the exceedingly cruel punishments he imposed during his reign. In the English-speaking world, Vlad III is best known for inspiring the name of the eponymous vampire in Bram Stoker's 1897 novel Dracula. As prince, Vlad maintained an independent policy in relation to the Ottoman Empire and a defender of Wallachia against Ottoman expansionism. Collect categories, resource links, and templates. Expand the open task listing above. Create new articles where none exist. Report new articles of adequate length at Template talk:Did you know. Ensure accuracy of entries in Wikipedia lists and timelines. Fact check descriptions of Middle Ages military history within other types of articles. Raise existing articles to good article and featured article status. Recognize good work by awarding barnstars and good article tags where appropriate. Re-write the crusade article. Presently it is in terrible shape. Re-write the Saladin article. Also in terrible shape. Bring First Crusade and Second Crusade up to current Featured Article standards. They are FAs, but of a different era of Wikipedia. Continue to make Kingdom of Jerusalem a Good or Featured Article. Continue to improve the problem articles at Talk:Franco-Mongol alliance#List of articles for review. Continue to improve articles about notable crusaders, especially the Kings of Jerusalem, who all deserve at least Good Article status.